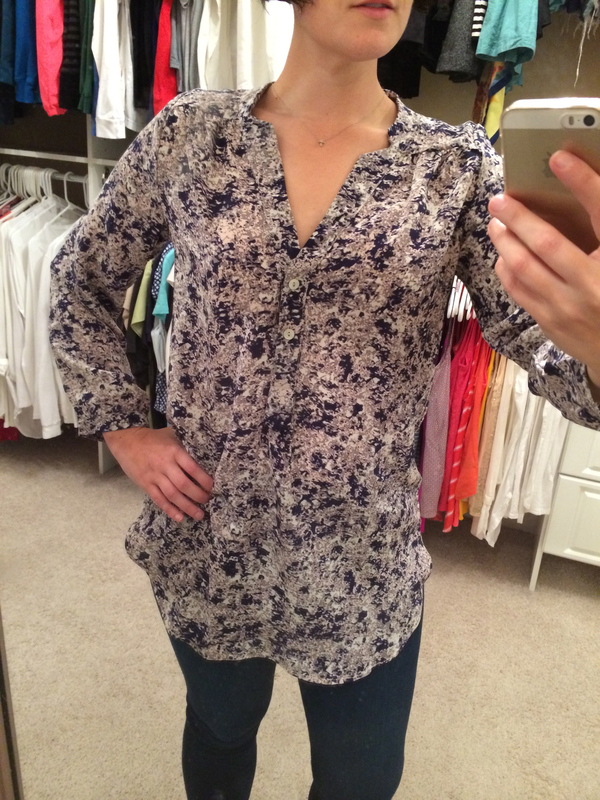 I’m a little late posting this one, but this is my review for my September Stitch Fix box. 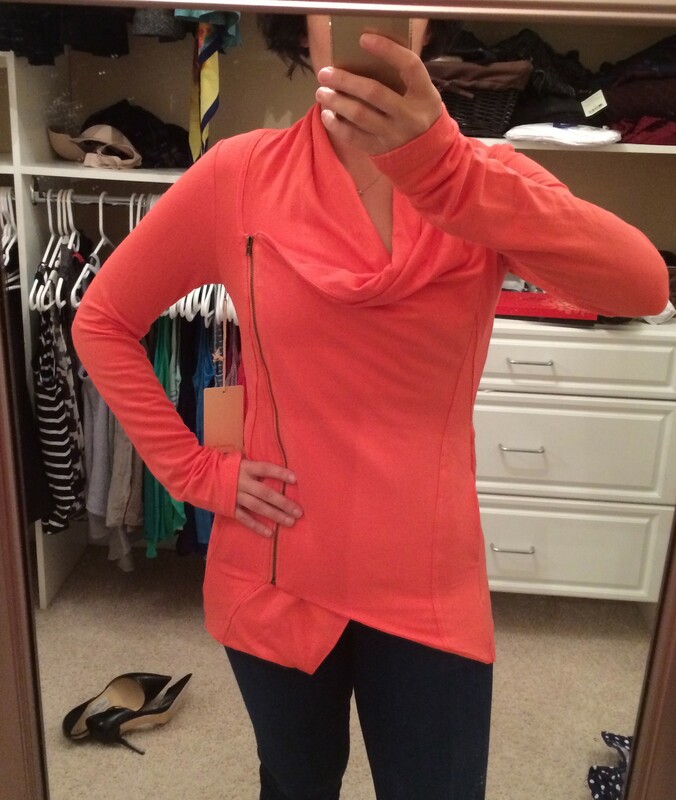 If you are not sure how Stitch Fix works, click here and read my first review. Jenny L was my stylist again, and did an awesome job… again 🙂 It was another perfect mix of requested pieces and surprises and everything fit well. I’m starting with the only “miss” in the fix. The fit was great, and the material was a thicker cotton with stretch. However, the polka dots and navy and white color scheme were screaming spring and summer to me, instead of heading into fall, and overall the look is a little too preppy for me. This was a requested piece, and I wanted to love it. The material was amazingly soft and comfortable, but unfortunately much thinner than I had anticipated – so you can see every wrinkle from the overlapping fabric and every line from the jeans I wore with it. This was a return. Is it or is it not a 3/4 sleeve? That is the question. Well, let’s start with the positives – this is a very high quality piece – well made, seriously luxurious fabric (100% good quality silk)- and I believe worth the price tag. I am usually not huge on prints, but I loved this one and the colors. However, as you can see by the picture, it is waaay too long. If you changed the material to a white cotton, it could be a nightgown. Also, because I’m so petite, the sleeve length was not quite 3/4 and also not quite full length. Unwillingly, this went back into the bag. This was one of my surprises, and Jenny L. really hit the nail on the head with this one. I loved it. The lace detail on the sleeve and the back was beautiful. I tried so hard to convince myself to keep this one, but it just wasn’t flattering. I don’t necessarily mind a boxy cut, but the darts at the bust hit me below the bust and overall was just a little too big. The sleeves although beautifully done, hit my arm at an awkward place also. This is the piece that I tried on at least 4 times, and most reluctantly put back in the bag. I am feeling a case of “Stitch Fix regret” coming on, I loved the style of this so much, but it just wasn’t flattering, dang it. So I received the blue version of these a few fixes ago and although I liked the fit, I wasn’t crazy about the blue color. I asked to try these again in black, and so glad I received them! The inseam is perfect, the pants fit perfectly for both work and play – fitted, but not tight – and they are comfortable! I have already worn these twice since receiving (on a plane and for work) – perfect for traveling! Overall, I am still so happy Jenny L. is my stylist and think she did a great job. 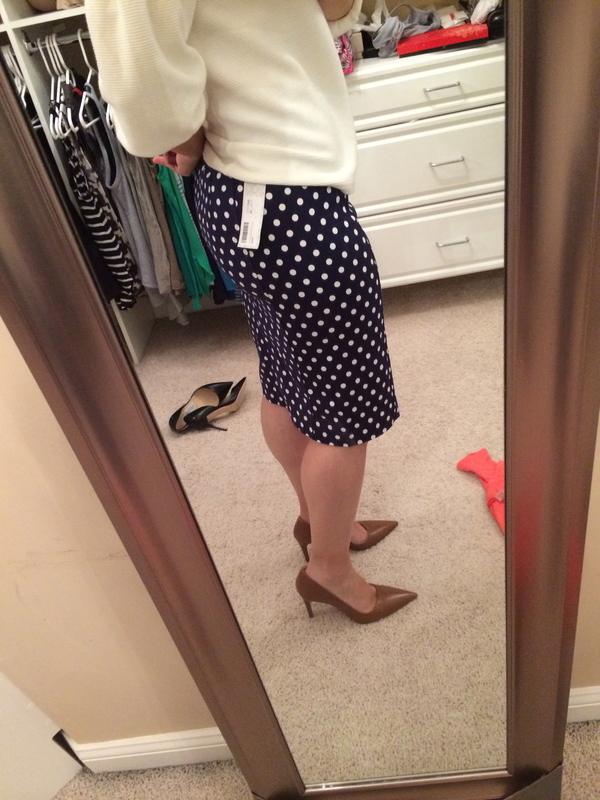 I loved all the pieces she sent except for the polka dot skirt. This fix was again a perfect mix of requested pieces and some “surprises” that were awesome. 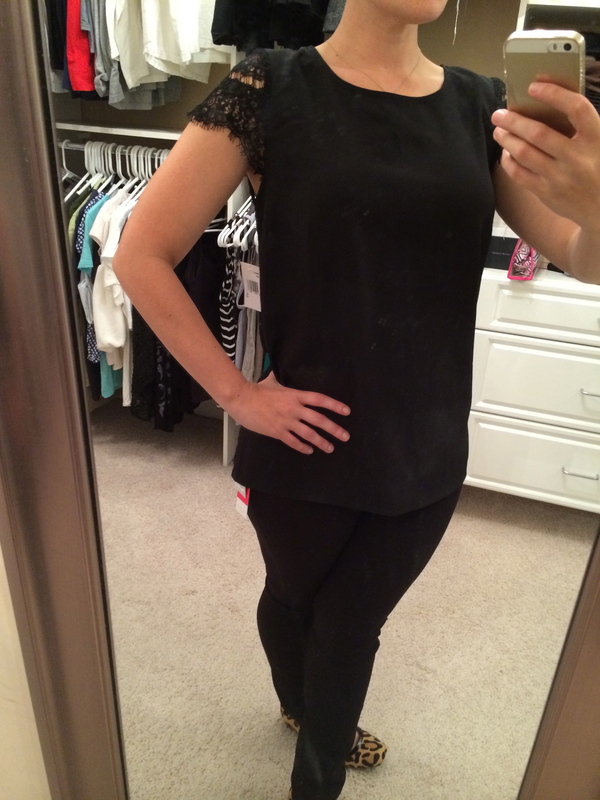 Ugh, there I go again thinking about the black lace shirt…. 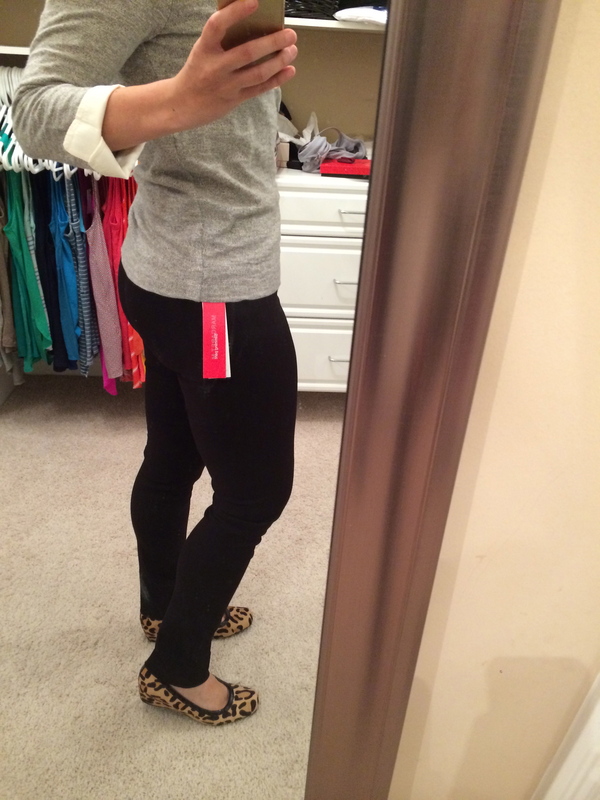 I am still enjoying Stitch Fix, and if you would like a “fix” yourself, here is my referral link to get started! 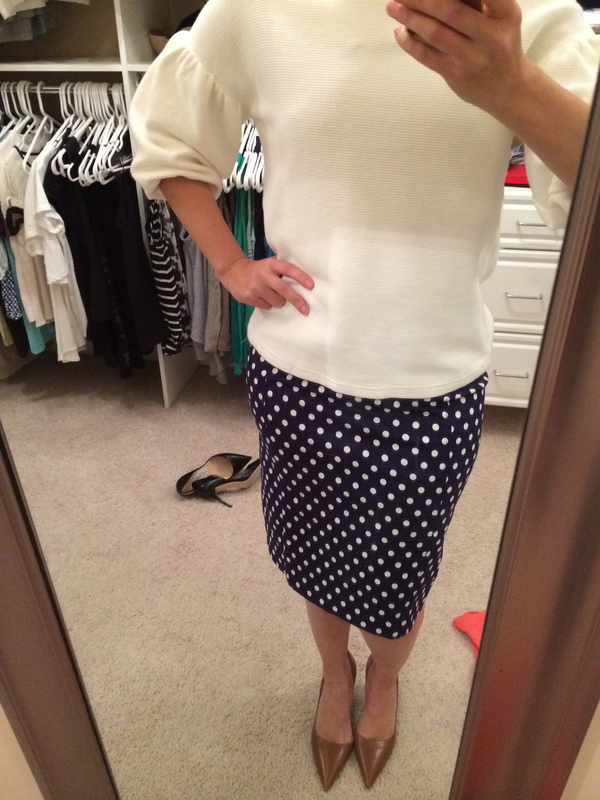 This entry was posted in Accessories, Clothing, Fashion, Uncategorized and tagged Amour Vert, Kensie, Margaret M, polka dot skirt, Pomelo, September 2014 Stitch Fix Review, September Stitch Fix Review, Stitch Fix Review by surgeoninkicks. Bookmark the permalink.